If you’re lucky enough to be in New York anytime from March 1 through May 28, you’ll want to check out MoMA’s exhibit, Abbas Kiarostami: Image Maker. There’s a gallery installation from 2004 and, in conjunction, a film retrospective. 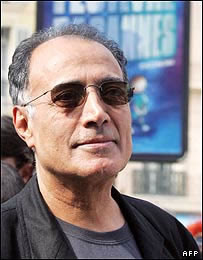 Kiarostami (pictured) will be at MoMA on March 1, and we want to know: will he or won’t he wear his trademark dark shades? Some residents of Beverly Hills are miffed that city council ballots are printed in Persian as well as English this year. This LA Times editorial does a decent job of calling this what it is: xenophobia. Five women in Iran go on trial in about a week for “acting against national security.” (Anyone else noticing lately that the Islamic Republic and the United States are sounding more and more like two peas in the same rhetoric-heavy pod?) The women’s crime? Peaceful protest. Also: the Iranian government wants to crack down on Iranian women dressing “inappropriately”. Stop bullying Iran, wrote Hossein Derakhshan in the Guardian a few days ago. He also says he’d go back and fight for Iran if the U.S. attacks. A provocative view, to be sure, and the reader comments below the piece are fascinating. One film is missing in this film retrospective: Ghazieh-ye Shekl-e Avval, Ghazieh-ye Shekl-e Dovom (First Case, Second Case). Made in the first year of the revolution (1979). The movie examines the tolerance of the dissendents–now in power– towards dissent againt their own political establishment. It contans a series of interviews with the Iranian revolutionary ministers, The Communist party leaders, and independent intellectuals, asking them a simple question about an act of dissent in an elementary school. The movie says a lot about the Iranian revolution and the nature of “diassent”. It is one of my Kiarostami’s favorites.